Whether you choose to live in a big city, a small town or somewhere in between, as a young professional, there are certain things that you’re going to want in your neighborhood that may differ from what other groups, like young families or retirees, are looking for. What’s The Walkability Of The Neighborhood? As a young professional, you want to have certain things right outside your door. Living in a walkable neighborhood can make the experience of living there more convenient and more enjoyable. It can also be a great way to meet your neighbors and start connecting with other young professionals in your new neighborhood. When you’re looking at a property, check out what’s within immediate walking distance. Are you close to coffee shops, a grocery story or a park? Can you see yourself easily walking to run errands or get the things you need? Now, walkability is more feasible in certain locations than in others. So, if you’re looking in a city or town that isn’t known for being very walkable, you’ll want to look at the convenience of the layout. Is the city or town center within biking distance or a quick drive away? Are all the stores, shops and food establishments centrally located, so once you get to that location, they are easy to navigate on foot? The more walkable your neighborhood, the less driving around you’ll have to do, which will make your life significantly more convenient. What Perks Does The Neighborhood Have That Will Fit In My Lifestyle? When you’re choosing a neighborhood, you want to be sure that it offers the kind of lifestyle that suits you as a young professional. Most young professionals want to move to a vibrant neighborhood that has numerous opportunities to explore the culture, food, outdoor and entertainment scenes. Keep in mind – virtually no neighborhood is going to have everything that you’re looking for. Make a list of the things that are important to your lifestyle and then use it as a guide when considering neighborhoods. Are you a person that values the arts? Then you’ll want to move to an area that has a number of interesting museums, galleries or cultural exhibits. Got a passion for all things food? Moving to a place that has a thriving restaurant scene will make you feel right at home. Love being outside? Look for an area that’s full of hiking paths, bike trails, and outdoor fitness activities. Figure out what kind of lifestyle you want to live in your new home and then find a neighborhood that embodies those values. How Convenient Is The Neighborhood To My Office? One of the defining characteristics of being a young professional is (obviously) involvement in the professional world. And when choosing a neighborhood, you want to be sure you choose an area that’s convenient to your place of work. Now, this will mean different things to different people. Some people want to be able to open their door in the morning and walk to their office in less than 10 minutes. Others would prefer to live in a suburb and commute to the city on public transportation. Others are fine driving to and from the office. Whatever situation you prefer is fine. Just be sure that the area you choose to live makes sense with your preference. Looking to take public transportation? Make sure your neighborhood has a transit stop nearby that will take you to your office. Prefer to drive? Make sure that you won’t spend hours every morning sitting in traffic en route to work. How Will This Neighborhood Grow With Me? Finally, when choosing a home and a neighborhood as a young professional, it’s important to remember that you won’t ALWAYS be a young professional. You want to choose a neighborhood that will grow with you. This is especially important if you’re planning to buy, but even if you’re renting, you want to choose a neighborhood that will grow with you for at least a few years; no one likes to pack up and move their life every 12 months. Not only is it inconvenient, but it’s expensive. When you’re choosing a neighborhood, look at it objectively and ask yourself “Will this neighborhood still make sense for me in 5 years?” If you’re planning on having a family, you might want to research the school system and check out if there are any parks or playgrounds nearby. If you’re young and enjoy going out to nightclubs, you might also want to see what other types of recreational activities the neighborhood offers for when clubbing loses its appeal. Most great neighborhoods offer plenty to do, see and experience for people in all stages of life. Before you commit to a neighborhood, be sure it’s the kind of place that you can enjoy as you grow. 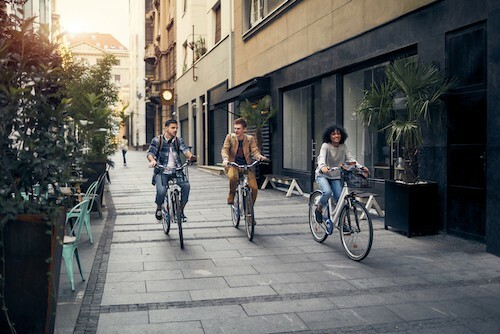 Asking yourself these questions before you settle on a neighborhood can help you make the best decision on the place that’s right for you as a young professional – and leave you enjoying that neighborhood for years to come. Contact us and let’s talk about your options here in the Gainesville area & surrounding communities.